With the advent of Distributed Sky we had to make adjustments to Drone Employee product as well. 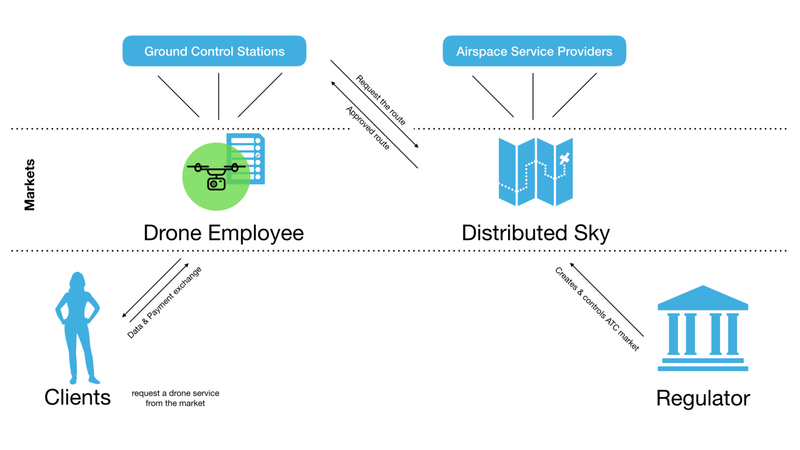 Let me explain how the newly created Distributed Sky will work with Drone Employee. 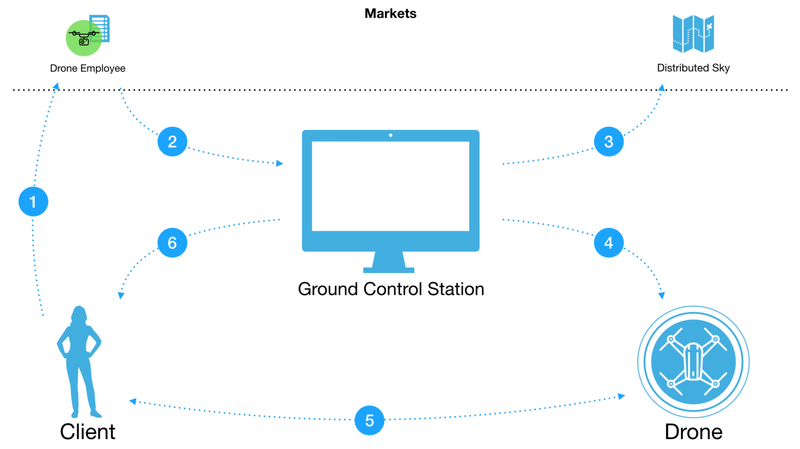 Ground Control Stations are drone businesses connected to Drone Employee and united by the Drone Services Market. You can become one of them by installing our software. Airspace Service providers are companies authorized by the regulator to offer air traffic control services in their local area. They are connected to Distributed Sky and are united by Air Traffic Control Market. We believe that market mechanisms are the best way to organize, maintain and regulate complex structures such as global UTM system. Distributed Sky will work with government regulators and Airspace Service Providers — local companies that collect, store and update 3D maps and weather data for their local territory. This type of architecture allows national regulators to stay in control of the airspace by distributing the rights to perform air traffic control services among local companies. Moreover, a decentralized architecture for air traffic control allows responding quickly to demands of the market. If the number of flights in particular area is high it will be more viable to become Airspace Service Provider. More companies will appear until there is enough to efficiently control this particular piece of airspace. Let me explain how the process will work. Airspace Service Providers will be approved by the regulator. This helps prevent malicious actors getting access to ATC services and allows to have more control over the distribution of responsibility geographically. Next, Airspace Service Providers will offer their services on the free market. People who need to fly a drone will request a safe route from the Airspace Service Provider that is responsible for the area they want to fly in. The Blockchain technology and smart contract mechanism allow tracking efficiently all operations that happen over this particular area. And if the flight requires requesting a route from multiple Airspace Service Providers (think of a long distance flight from London to Beijing for example) our technology allows to integrate all Airspace Service Providers within one smart contract for a drone operator/owner’s convenience. The goal of Distributed Sky is to take an active position in the research initiative led by ICAO which is aimed at developing standards for an international drone traffic control system. The core team has already submitted an application. Drone Employee will continue working with commercial drone fleets. The compliance mechanism powered by Distributed Sky will be built inside Drone Employee product. The company is offering a solution for business owners to hire drones and manage drone fleets. Our ultimate vision is the advent of specialized businesses — Ground Control Stations. They will act as “taxi parks” where any client (both business and individual) can hire a drone for her specific needs. The emergence of drone sharing economy is only a matter of time. The main benefit of blockchain technology is reduced friction between market participants. Regulation — in most countries it is still not allowed to fly drones for longer distances because regulators require the operator to constantly see the drone. This limits the application of Drone Employee to areas where long distance flights are not required. Hardware imperfections — commercial drones are a pretty new concept and manufacturers are still working on making their hardware safer. Some manufacturers already started implementing advanced vision sensors, guards for propellers and even parachutes so that drones could land safely in case of an emergency. It is yet to be seen what would be the best design for a drone. Negative public perception of drones — people still are afraid of drones. Whenever somebody sees a flying drone they ask whether you are spying or doing other illegal activity. People in commercial drone industry work hard to educate the public about the benefits of drone technology to make it more appealing, but we are still not yet there. Despite all these facts, we still continue using Drone Employee in commercial drone applications. We are open to partnerships with both people who already operate a fleet of drones and those who are just starting to use drones in their business. The major drone applications we work with include filming, monitoring, and delivery. The client comes to the scenic area and wants to order a video from a drone. She goes to Facebook and finds the chatbot which accepts the orders for drone services in her area. All she has to do is ask for a drone to come via text. The Ground Control Station that won has to prepare the mission. It goes to Distributed Sky market and purchases a safe route from the local Airspace Service Provider. This is an example of 2 machines creating a contract without human involvement! The station sends parameters of the mission to the drone, including GPS coordinates, the angle of the camera, the length and time of the flight. These parameters are also included in a smart contract between the client and the drone which guarantees that the parameters will be fulfilled as promised or the client will not be charged. The drone takes off, comes to the client and films the video she requested. When the mission is complete the drone sends the video to the client and receives a payment according to a smart contract they created. The client who wants to order a drone service just requests it from the market and the most suitable provider wins this order. The business that receives this order has to work with partners to deliver it. When we reach the point where drones will be as common as cars in our cities the market mechanisms will help us regulate the flights safely. As you may have noticed, we now created 2 markets: drone services market and airspace management market. But the supply chain of a drone service can potentially become much more complex. Our goal is to create or help other companies create market mechanisms for other verticals for commercial drone industry. This way, when a Ground Control Station buys the route from an Airspace service provider in Step 3, it will also buy insurance and additional software for data analysis. It can even order maintenance from the local repair shop and send the drones for repairs automatically. We expect that the number of markets will be growing as commercial drone industry matures. And our mission is to provide effective market mechanisms to all stakeholders in the industry so that we could all grow and expand without friction! What’s in the future for you, me and Drone Employee?